Inspired by the pathbreaking work of Howard Zinn, A People’s Art History of the United States is propelled by a democratic vision of art, showing that art doesn’t just belong within the confines of museums and archives. In fact, art is created every day in the street and all around us, and everyone deserves to be a part of it. Called “important” by renowned art critic Lucy Lippard, A People’s Art History of the United States introduces us to key works of American radical art alongside dramatic retellings of the histories that inspired them. 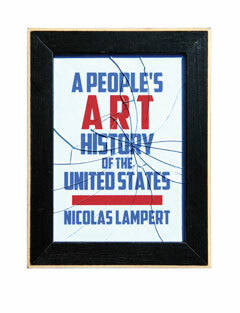 Richly illustrated with more than two hundred black-and-white images, this book by acclaimed artist and author Nicolas Lampert is the go-to resource for everyone who wants to know what activist art can and does do for our society. Spanning the abolitionist movement, early labor movements, women’s suffrage, the civil rights movement, and up to the present antiglobalization movement and beyond, A People’s Art History of the United States is a wonderful read as well as a brilliant tool kit for today’s artists and activists to adapt past tactics to the present, utilizing art and media as a form of civil disobedience. Truthout calls A People's Art History of the United States "fascinating" in their review.